The Global Volcanism Program has no activity reports for Maruyama. The Global Volcanism Program has no Weekly Reports available for Maruyama. The Global Volcanism Program has no Bulletin Reports available for Maruyama. The Nipesotsu-Maruyama volcano group, located west of Nukabira Lake about 20 km E of Tokachidake volcano, is composed of a number of overlapping andesitic-to-rhyolitic stratovolcanoes and lava domes constructed along a NW-SE trend. These volcanoes overlap the SW rim and SW caldera floor of the Pleistocene Tokachimitsumata caldera. The highest peak in the complex is Nipesotsuyama stratovolcano, which was active during the mid-Pleistocene, about 0.4-0.2 million years ago. The Maruyama stratovolcano and lava dome at the southern end of the complex was discovered to be a Quaternary volcano only in 1989. It is also referred to as Higashi-Tokachi-Maruyama to distinguish it from several other volcanoes named Maruyama, which means "Round Mountain." A minor phreatic eruption took place at the Maruyama lava dome in 1898, and fumaroles are present on one of its summit craters. Hasegawa T, Ishii E, Nakagawa M, 2008. Correlations of distal ash layers in the Akan pyroclastic deposits, eastern Hokkaido, with large-scale pyroclastic flow deposits distributed in central Hokkaido, Japan. J Geol Soc Japan, 114: 366-381 (in Japanese with English abs). Ishii E, Nakagawa M, Saito H, Yamamoto A, 2008. The Pleistocene Tokachimitsumata caldera and associated pyroclastic flow deposits in central Hokkaido, Japan: correlation of large-scale pyroclastic flow deposits with source calderas. J Geol Soc Japan, 114: 348-365 (in Japanese with English abs). There is no Deformation History data available for Maruyama. There is no Emissions History data available for Maruyama. Hydrothermally altered rocks in the crater of Maru-yama lava dome are seen in the foreground of this aerial view from the NE. 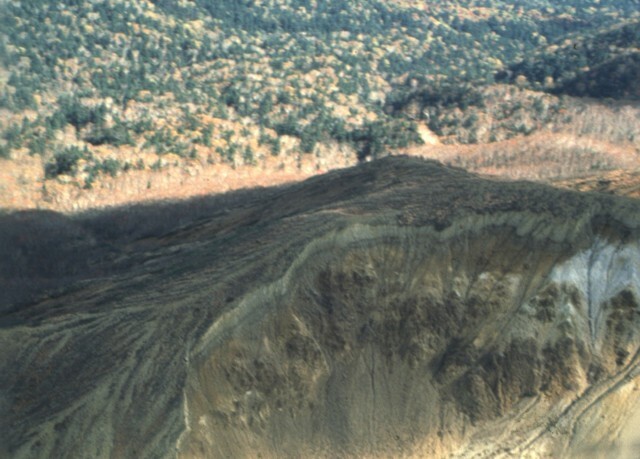 Maru-yama, which had a minor phreatic eruption in 1898, is part of the Nipesotsu-Maruyama volcano group, located in central Hokkaido east of Tokachi-dake volcano. The volcano group is composed of a number of overlapping andesitic-to-dacitic stratovolcanoes and lava domes along a NW-SE trend. 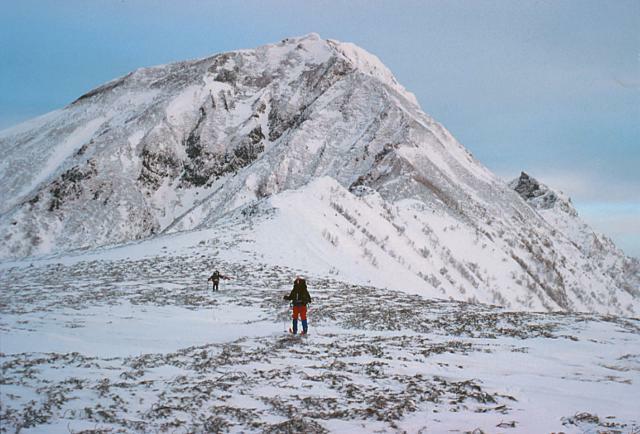 Cross-country skiers in the saddle between Nipesotsu-dake stratovolcano and Maru-yama lava dome approach the south side of 2013-m-high Nipesotsu volcano. The Nipesotsu-Maruyama volcano group, located east of Tokachi-dake volcano, is composed of a number of overlapping andesitic-to-dacitic lava domes constructed along a NW-SE trend. A minor phreatic eruption took place at Maru-yama lava dome in 1898, and fumaroles are present on one of its summit craters. Copyrighted photo by Yoshihiro Ishizuka, 1998 (Japanese Quaternary Volcanoes database, RIODB, http://riodb02.ibase.aist.go.jp/strata/VOL_JP/EN/index.htm and Geol Surv Japan, AIST, http://www.gsj.jp/). There are no samples for Maruyama in the Smithsonian's NMNH Department of Mineral Sciences Rock and Ore collection. Large Eruptions of Maruyama Information about large Quaternary eruptions (VEI >= 4) is cataloged in the Large Magnitude Explosive Volcanic Eruptions (LaMEVE) database of the Volcano Global Risk Identification and Analysis Project (VOGRIPA).